Bird of paradise (Strelitzia reginae) is an evegreen perennial that resembles a banana tree with its oblong, fanlike leaves. But this plant produces a unique orange and purple bloom that looks like a bird's head and crown. A native of South Africa, bird of paradise thrives in USDA zones 9 to 11. Bird of paradise is an evergreen tropical that produces excellent, long-lasting cut flowers and is often used in arrangements. Bird of paradise thrives in warm climates with light shade and regular watering. These plants grow best in large clumps, so they should be thinned out only occasionally. Leaf stalks may grow to 1-1/2 feet high while the plant can reach 5 feet. Bird of paradise may be fertilized with a peat-based product twice a month during growing season. Dead leaves or spent blooms may be removed in fall or winter. 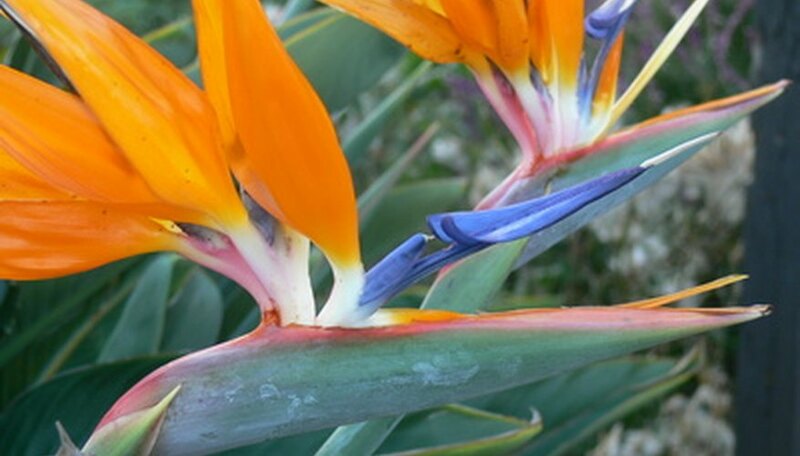 A bird of paradise flower is comprised of six upright, orange sepals and three vivid blue petals. The flowers are interspersed to create a plume or crown effect. One of the blue petals extends out like a tongue; this is the female part of the flower. The bird of paradise flower grows out of a bract, that, like the leaves of this plant, grows on its own stem. The bract may have shades of red or purple. The bract is the bent end of a stalk and is triangular or kayak-shaped, with a pointed end that grows horizontal to the ground. The flower blooms out of this structure. Birds of paradise are pollinated with the help of birds, often sunbirds, that transfer the pollen. When a bird lands on the top of the flower crown, its weight opens the petals and the exposed pollen may stick to a bird's breast. When the bird flies to the next plant, it then deposits the pollen to the stigma of a new flower. The giant bird of paradise (Strelitzia nicolai) is similar to its smaller cousin but has white and purple petals, grows to 30 feet and has leaves that grow to 10 feet each. Leaves from this plant fan out from a central base and are gray-green in color.